David Low Chor Hoon, holder of the overall Singapore EY Entrepreneur of the Year 2016, bought a old corner bungalow in Gallop Park from a retired developer. The price was at $22.888M. Based on a land area of 17,042 sqft, the price works out to be $1,343 psf. David Low, the chairman and CE of Futuristic Store Fixtures, intends to redevelop the site into a new 2-storey (with basement and attic) house of about 13,000 sqft. The Victoria Park Bungalow, in the prestigious GCB area, was built about 20 years agi and sits on a 999-year leasehold land of size 29,955 sqft. This translate to S$1335 psf based on land area. The 2-storey house with a basement is sitting on a regular-shaped elevated plot and said to have 5 bedrooms with a swimming pool and large koi pond. Far East Organisation bought a Good Class Bungalow (GCB) on a freehold site of over 39,000 square feet at 16 King Albert Park. Far East is paying S$43.8 million for 16 King Albert Park, translating to S$1,117 per square foot (psf) based on the freehold land area of 39,228 sq ft. The group’s existing four plots add up to 69,803 sq ft.
Based on the total land area of 109,031 sq ft, up to seven bungalows may be developed based on the minimum plot size of 15,070 sq ft per bungalow in Good Class Bungalow Areas. The plan is to redeveloping the enlarged site of over 100,000 sq ft into several bungalows which the group will hold as an investment property for rental income. 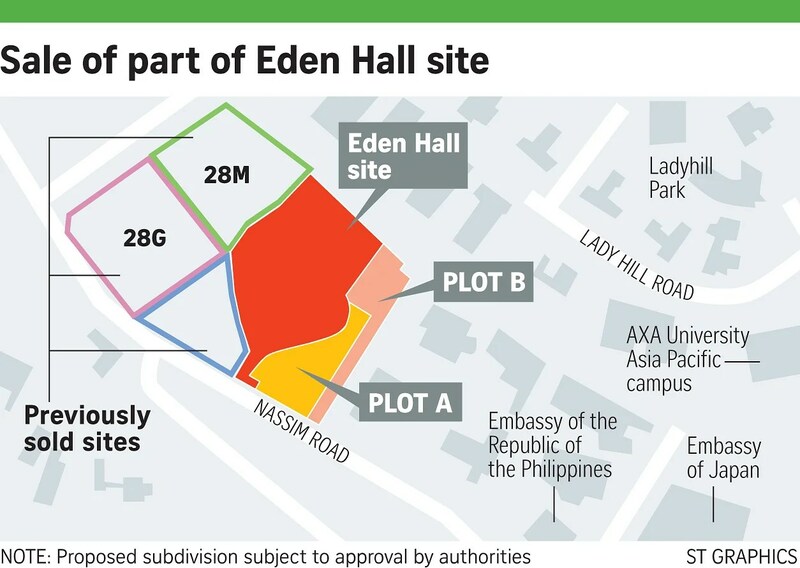 The British government has put more of the Eden Hall land around its High Commissioner’s residence in Nassim Road up for sale, after selling off a portion in 2001. It has carved out two freehold land plots from the garden land for buyers with deep pockets interested in securing some of the plummiest land in Singapore. The indicative price for Plot A, which is about 18,620 sq ft and comes with about 36m of Nassim Road frontage, is $40.964 million, or $2,200 per sq ft (psf). The guide price for Plot B, which is about 15,634 sq ft and has a frontage of about 8m in Nassim Road, is $31.268 million or $2,000 psf. “Based on recent market feedback, CBRE is very confident that these prices will be exceeded,” the marketing agent said. Nassim’s tree-lined boulevards… on ample ground offer owners total privacy, right in the heart of town… Eden Hall is steeped in history and the sale of the two plots represents a landmark sale in the GCB market. Eden Hall itself, a conservation bungalow, remains the official residence of Britain’s High Commissioner here. CBRE noted that land for Good Class Bungalows (GCBs) in the Nassim Road area is tightly held and rarely available for sale. “Nassim’s tree-lined boulevards… on ample ground offer owners total privacy, right in the heart of town… Eden Hall is steeped in history and the sale of the two plots represents a landmark sale in the GCB market,” said Ms Sammi Lim, associate director of investment properties at CBRE. The properties are being offered on a vacant site basis. The British government had, in 2001, sold off a portion of the site, which was originally more than 200,000 sq ft.
Motoring tycoon Peter Kwee and “Popiah King” Sam Goi bought the roughly 109,000 sq ft parcel in April 2001 for $50.4 million. Mr Kwee took the larger part of about 63,300 sq ft. He then sold 39,383 sq ft to Ms Oei Siu Hoa, a member of Indonesia’s Widjaja family and sister of businessman Oei Hong Leong, for $25.5 million in 2003. It is now 28M Nassim Road. Mr Kwee sold the other part, a 23,922 sq ft plot, to former Sincere Watch chairman Tay Liam Wee for $47.84 million in 2012. Mr Tay is expected to build a bungalow on the site, according to reports. Mr Goi continues to own 28G Nassim Road, a 45,754 sq ft site. After the two plots are sold, the Eden Hall site will still be sized at about 63,893 sq ft.
CBRE noted that over the last eight years, Nassim Road has had just three GCB sales. Most recently, in April 2013, a company controlled by Wing Tai chairman Cheng Wai Keung and his wife put up a GCB at 33 Nassim Road for sale. The 84,839 sq ft site, which has a price tag of about $250 million to $300 million, is not yet sold. URA have revised the guidelines for strata landed housing developments to improve their compatibility with the environment of landed housing estates. This complements efforts to inject more greenery in Singapore’s urban environment in the recently announced LUSH 2.0 Programme. There is a new set of formulae to determine the maximum number of houses allowed in various types of strata landed housing developments and new guidelines to enhance the communal facilities and greenery provision within such developments. The Urban Redevelopment Authority (URA) has revised the guidelines for strata landed housing developments to improve their compatibility with the environment of landed housing estates. The revised guidelines also complement URA’s efforts to inject more greenery in our urban environment in the recently announced LUSH 2.0 Programme. Under the revised guidelines, there is a new set of formulae to determine the maximum number of houses allowed in various types of strata landed housing developments. The new formulae will generally result in fewer strata landed units compared to the previous formulae. It addresses feedback from residents in landed housing estates that such developments could inject a disproportionately large number of units, causing additional traffic and parking problems as well as creating a more congested living environment. There are also new guidelines to enhance the communal facilities and greenery provision within such developments. Developers will have to set aside at least 45 per cent of the land area for communal open space, up from the current 30 per cent. Of this, a minimum of 25 per cent has to be set aside for on-ground greenery while up to 20 per cent can be used for communal facilities like swimming pools and playgrounds. The revised guidelines apply with immediate effect from 23 August 2014. See Annex A for an overview of the revised guidelines. Commonly known as cluster housing, strata landed housing is a form of landed housing that comes with strata titles. They are allowed within landed housing estates, including Good Class Bungalow Areas. It offers home buyers a housing option that combines landed housing living with communal facilities and greenery like those available in private condominiums. Communal open space forms part of the common property area of strata landed housing developments and include gardens, landscaped areas and recreational facilities such as swimming pools and playgrounds for the common enjoyment of the residents. Communal open spaces safeguard the provision of communal facilities and spaces within the development, and create a sense of openness that many people desire. By increasing the minimum communal open space to be set aside in strata landed housing developments and mandating minimum on-ground greenery coverage, we hope that strata landed housing developments will further enhance the quality of the living environment for residents.